Two school districts are adopting the use of body cameras this fall to record interactions. Houston Independent School District in Texas will issue the cameras to members of its police force. At Burlington Community School District in Iowa the cameras will be worn by principals and other building administrators to capture private meetings with students and parents. The Iowa decision came this summer after it was requested by a principal in one of its middle schools who was accused of assaulting a student. Video evidence showed that he hadn't done so; but the current surveillance cameras in use captured only images, not audio, which made it impossible for the district to investigate accusations of verbal misconduct. In a statement, the district said the cameras were intended to "protect everyone, while also holding administrators accountable for their behavior." According to news coverage in the Des Moines Register, the district purchased 13 cameras for $85 each. The cameras record with a time and date stamp and can be turned on and off. Before they're turned on to record, the administrator will read a script, informing the person of the intent to record the conversation and giving him or her the option of declining to be recorded. The district emphasized that files would be retained only for the purposes of investigation or "as determined by the administrator." The decision to outfit Houston ISD's police officers with the "body-worn cameras" follows a four-month pilot project in which the devices were worn by 25 officers. There, the district chose the WatchGuard Video VISTA high-definition camera. The district has almost 250 police officers and security people on staff. "As the largest district in the state, we have close to 300 schools, 215,000 students and 28,000 employees that we need to keep safe," said Police Chief Robert Mock at the time of the pilot on the district blog. "These cameras will serve as a vital tool to better monitor school environments, evaluate school incidents and ensure our officers are performing well." 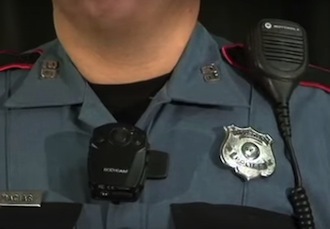 In a district video Mock noted that the cameras were about the size of a pager and would be worn on officer lapels. "Any time they approach an incident or something noteworthy, they can turn the camera on and start recording," he said. "We feel this is a best practice that is a trend across the nation...and we want to be at the forefront of providing this tool for our officers."